Bolshevik leader Vladimir Lenin, rushing to join the Russian Revolution, arrives in Stockholm after passing through hostile Germany. Follow his momentous trip with #1917LIVE and the real-time #LeninTracker. As the February Revolution toppled the Tsarist regime earlier in 1917, the Bolshevik party finds itself weak and poorly organized – most of its leaders were in exile at the time. Vladimir Ulyanov, already known by his pseudonym Lenin, was in exile in Switzerland. Having missed the start of the First Russian Revolution of 1905, Lenin felt it was now or never – he must make it to the capital, St. Petersburg (then called Petrograd). But it wasn’t easy – World War I was raging in Europe and such a journey was perilous. Unhappy with Lenin’s anti-war position, the British denied him passage through their territory. So Lenin and three dozen fellow Bolsheviks struck a deal with Germany, Russia’s enemy in the war, to let them pass through its territory. 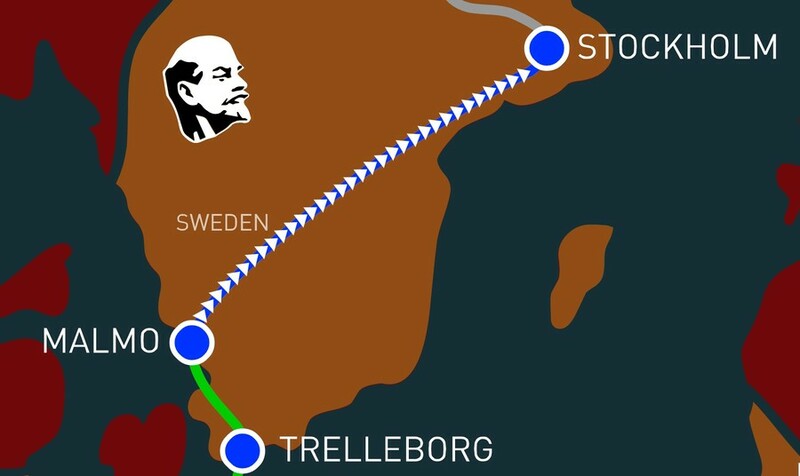 After a three-day journey in a “sealed” train car, which had diplomatic immunity, 32 Bolsheviks safely make it to neutral Sweden. On April 13, 1917, the Russian political émigrés arrive in Stockholm, where they receive a warm welcome by Swedish Socialists. They stay at the Hotel Regina, where Lenin holds meetings with Russian political émigrés and Swedish Social-Democrats. Being so far away from Russia, he is desperately seeking up-to-date information about the situation in revolutionary Petrograd. The only known photo of the group was taken in Stockholm. 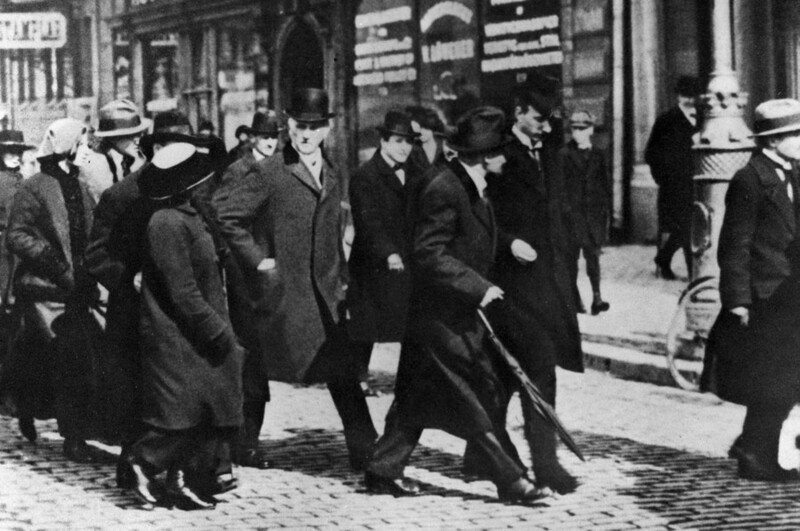 Here Lenin (with umbrella) and his fellow Bolsheviks walk through the city accompanied by Swedish Socialists Ture Nerman and Carl Lindhagen. Because of Lenin’s shabby look, his comrades convince him to buy some new clothing and shoes at a local department store. There he also buys his signature cap, perfecting his proletarian revolutionary look. In the evening the group departs the Swedish capital and heads north to the border with Finland, which at the time was part of the Russian Empire. Despite belligerent Germany being left behind, the most dangerous part of the journey lies ahead. The Bolsheviks do not know how they will be treated at the Russian border – they could easily be arrested as traitors. The Swedish town of Haparanda is the next stop on this historic journey and you can follow it with the #LeninTracker – part of the #1917LIVE project, which brings you the latest news from revolutionary Russia in real time hundred years ago.